The exhibit "Artists' Books and Archives from Atlanta Contemporary Art Center, Nexus Contemporary Art Center, and Nexus Press" will run Aug. 20, 2015, through May 15, 2016, on Level 2 of Emory's Robert W. Woodruff Library. An exhibit of artists' books and other archival material from the Atlanta Contemporary Art Center, Nexus Contemporary Art Center and Nexus Press collection opens Aug. 20 on Level 2 of Emory's Robert W. Woodruff Library. The exhibit will highlight selected materials from the collection, recently acquired by the Manuscript, Archives and Rare Book Library (MARBL) at Emory University. "Artists' Books and Archives from Atlanta Contemporary Art Center, Nexus Contemporary Art Center, and Nexus Press" will feature approximately 15 artists' books displayed at a time in three cases. A fresh crop of books focusing on new themes will rotate in every three months. A fourth case will feature archival material from records of the Atlanta Contemporary Art Center, the parent organization of Nexus Press. Curators of the exhibit are Lauran Whitworth, a MARBL graduate curatorial assistant and doctoral candidate in Women's, Gender, and Sexuality Studies at Emory; Julie Newton, conservator in the Emory Libraries Preservation Office; and Randy Gue, MARBL curator of modern political and historical collections. "This exhibit will show that Nexus Press book artists were at the cutting-edge of the exploration of what celebrated book artist Ruth Laxson called 'the world between word and image,'" Newton says. Gue says subject librarians Sandra Still and Kim Collins have spent years building the library's collection of these unique, locally produced books, several of which will be on display. The exhibit is open to the public at no charge. Books that challenge the traditional book form, such as a pop-up book by internationally known book artist Carol Barton and Berwyn Hung's tongue-in-cheek pack of cigarettes inscribed with the statement "I swear this is absolutely the last cigarette I will ever smoke" printed on individual cigarettes. 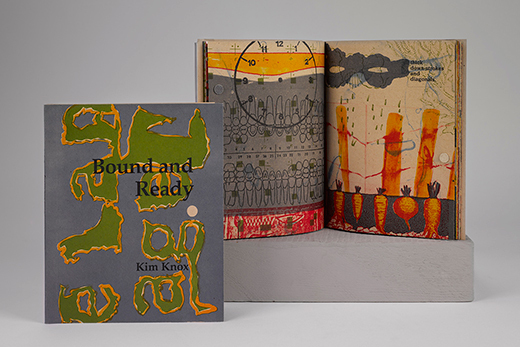 Books focused on Atlanta and the South, featuring works by local artists, some with Emory connections, including "Bound and Ready" by Kim Knox Norman, a former conservator in the Emory Libraries Preservation Office. Books produced by Nexus Press for the 1996 Cultural Olympiad, a project focused on bringing culture and arts to the Summer Olympic Games held in Atlanta that year. Nexus Press published five books (for the five Olympic rings) produced by book artists from around the globe, including one by Canadian Shelagh Keeley titled "Desire and the Importance of Failure," a book that Whitworth says "was chosen to represent all of North America." "I am excited about this exhibit because it brings together the library's long-term holdings — books created by Nexus Press — with the new acquisition of the Atlanta Contemporary Art Center records," Gue says. "The exhibit highlights Atlanta Contemporary's important role as the place where the local, regional, national and international contemporary arts community interacted with Atlanta and the South." The Woodruff Library at Emory University is located at 540 Asbury Circle in Atlanta, 30322. The exhibit, open during regular library hours, will conclude May 15, 2016. Parking is available in the Fishburne deck.